As we begin another yearlong effort, and a new website, I invite you to participate in the opportunity to exchange ideas and techniques. I know that many times a good case is found in the field that would make a worthy submission. The Journal's continued success depends on the active involvement and participation of its writers and readers. Equine dentistry is undergoing rapid advancement. The scientific research conducted worldwide, replaces hearsay with more and more evidence-based approaches to dentistry. The Journal of Equine Dentistry is committed to making this information accessible to practitioners. The Journal aims to streamline an ever-growing amount of data on the subject of equine dentistry into practical take-home information. As such, we would like to encourage researchers and practitioners to submit papers and case reports on equine dentistry. Please join our team today! There are many sections to choose from, and your help would be greatly appreciated. 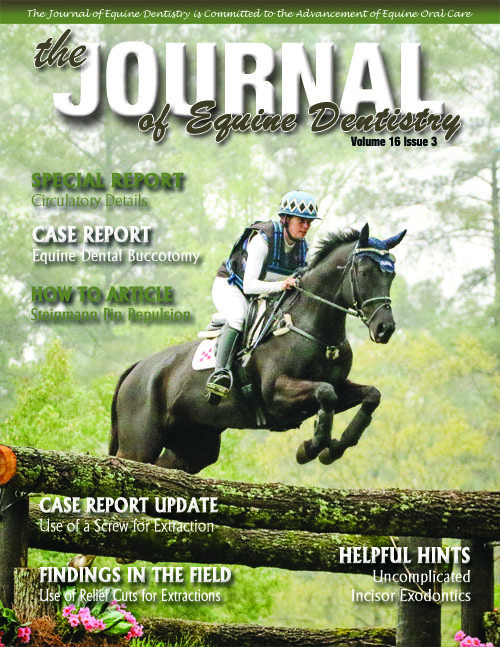 Indicate presented material as Informative Articles, Case Reports and Updates, Research, What's Your Evaluation?, Findings from the Field, Helpful Hints, New Products, or Upcoming Events and send to The Journal of Equine Dentistry, 10668 W Brent Rd, Hammett, Idaho, USA, 83627 or info@journalofequinedentistry.com. Include your name, address, phone number, and email address. Cooperation of all parties involved is the key to attaining our goal of better serving the horse. Cover Photo & Story: We are always searching for a stunning photo with a story. Please contact us if you have a cover photo. Photo requirements are in high resolution only. They can be mailed or emailed in digital form. We must have written permission from the photographer for the use of the photo. Findings in the Field is open to practitioners who would like to write about something interesting, or different, observed in the field. This includes variables on previously covered topics. The information found in this section can be anything from abnormal dentition to environmental influences. Helpful Hints focuses on tidbits of information, or any observations that would prove beneficial to the practitioner. What's Your Evaluation is an exciting section where the author presents a case with photos, radiographs, and enough information for the reader to make an assessment of the problem. The results of every case are found in the back of The Journal. The case usually has a bit of a twist to it, in order that the reader has to indeed think about it. Informative Articles, Case Report Updates, or Research Projects are always welcome. Submissions are very important and we encourage everyone to pull together and get involved. The Journal staff would like to focus on research and education. Knowledge generated by research is of the greatest importance and would ensure widespread benefits. Consistent reporting and gradual building of research projects will insure credibility for the industry. Upcoming Events Calendar style section to notify of future happenings in the industry. Please take into consideration the mailing time frame for upcoming events when submitting information.